Whenever I see pictures of roses climbing up an ornate trellis or arbor, the side of an old structure, fence or even up and along an old stone wall, it stirs up the romantic and nostalgic juices within me. I imagine it does the same for many folks due to the number of photos and paintings there are of such scenes. Creating this effect does not just merely happen. In most cases, it takes some real effort and an ever vigilant rose-loving gardener. 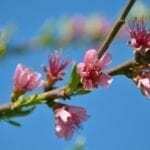 Next on the list is selecting the plants with the color, bloom form, fragrance and habit desired. Then stand back and create a vision or mind painting of what the desired outcome will be. After purchasing the climbing rose bushes that meet your needs, the training begins. I like to use either a rubbery wire, reinforced rope or stretchy vinyl type tie off material to attach the canes of the rose to the structure selected. While holding the canes in place, it also allows some flexibility so as not to damage them as they fill out and grow. Even with this flexibility, however, the ties will need to be changed out at some point due to growth. For training our roses up the side of a building or stone wall, provide some anchoring sets to tie off to. This can be done by drilling some small holes along the desired training path and setting an anchor, perhaps a friction fit type. I prefer expansion type anchors or glue in type, as they do not tend to work loose with wind and growth movement like the friction fit ones seem to do. Wait for the canes to grow enough to tie them off and train them to go in the direction of best support that fits your earlier mind painting. Canes that grow out and too far away from the structure initially can be either pruned out or monitored as they grow to see if they can be brought back into line and trained in the desired path. Do not make the mistake of letting them go too long though, as unruly canes can make for more work later. 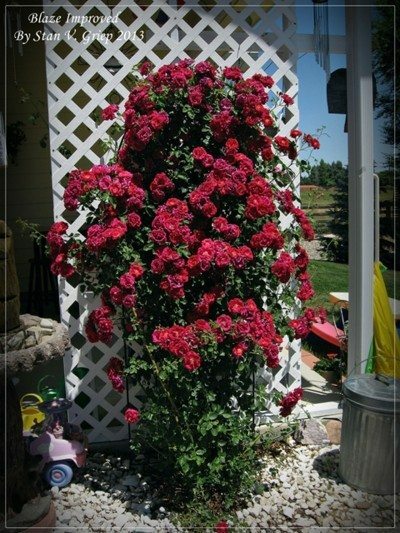 Climbing roses can become unruly in what seems like the blink of an eye. 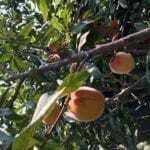 Once they become unruly, either change to allow some redirection or prune them back and wait for the new growth to begin again. I have been called to the homes of some folks that just moved into a new home where the climbing roses have turned into untamed monsters! This can and will happen if we do not stay vigilant. There are times when such a mess can be returned to the vision of beauty it once was, but it takes considerable work to get it done. Lots of pruning, stepping back to look at things, lots more pruning, then finally back to where things need to be. 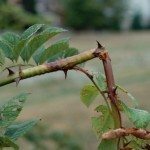 With some of the older climbing roses, heavy pruning will also mean sacrificing many blooms, as these older climbers only bloom on “old wood,” which refers to the previous season’s growth. Even so, it is best to do the work and bring the beautiful vision back. In some cases, like one I worked on, the bush has just gotten too out of control. The owner wanted it chopped down and removed. I asked her to allow me to try bringing it back. Late that fall after the bush started going dormant, I pruned the canes down to within 6 inches of the ground. Drastic move you say? Maybe, maybe not. The following spring the rose did indeed send up new growth. The new growth was gradually tied and retrained to a nice ornate trellis, which could then trail out onto the fence line on either side, thus returning to a vision of beauty once again. Climbing rose bushes are indeed work. They will demand your attention for some time to come. 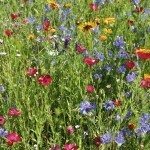 But if you are up for the challenge, you will be richly rewarded not only by the beauty you behold, but also the ooh’s and aah’s of delight from garden visitors and those enjoying your photos of the vision of beauty your efforts have created.